← A Wonderful Weekend at The Griswold’s…er, Hammond’s! 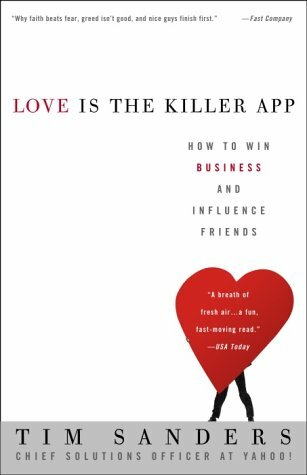 Over the weekend I picked up one of my all-time favorite books, Love is the Killer App, by Tim Sanders. I was fortunate enough to see Tim give a talk back in 2004 and it was honestly one of those “moments” in life you always remember. There are three intangibles, according to Tim, that are the keys to our success…both in business and in life. Possessing knowledge draws people to you. It makes you valuable. It leads to employment opportunities. The most successful people in the world can also be described as the most knowledgeable. Then it is up to your network and compassion to guide you on sharing your knowledge. In this economy, jobs are scarce. Increase your knowledge! It is free (if you have a library card or even internet access). I have shared this advice for years with colleagues, employees, and friends…”make yourself so valuable that no company could ever do without you!” Talk about job security! Unfortunately, I watch too many people lacking a plan to grow their knowledge, and as a result, their value. In 2004 I first learned the power of having a Knowledge Acquisition Plan (KAP). This means a system, or process, for always learning and improving. Primarily this comes from reading. I make it a habit to read every day for 30 minutes. This happens before I respond to emails, return phone calls, or work on projects. The results can be amazing. I learn something new everyday. I get motivated and inspired. I feel more balanced and sometimes even a bit super-charged. I have ideas and knowledge to share with customers and business partners each day (my network). I encourage you to create your own Knowledge Acquisition Plan. Set aside 15-30 minutes each day to read. Books should be 75%, and articles can be the other 25%. If you’re not sure where to start, pick up Tim Sander’s book. Become the most valuable person you can be, to both your friends, and your employer or employees.